School creates multiple challenges for kids with ADHD, but with patience and an effective plan, your child can thrive in the classroom. As a parent, you can work with your child and his or her teacher to implement practical strategies for learning both inside and out of the classroom. With consistent support, these strategies can help your child meet learning challenges—and experience success at school. The classroom environment can be a challenging place for a child with ADHD. The very tasks these students find the most difficult—sitting still, listening quietly, concentrating—are the ones they are required to do all day long. Perhaps most frustrating of all is that most these children want to be able to learn and behave like their unaffected peers. Neurological deficits, not unwillingness, keep kids with attention deficit disorder from learning in traditional ways. As a parent, you can help your child cope with these deficits and meet the challenges school creates. You can provide the most effective support: equipping your child with learning strategies for the classroom and communicating with teachers about how your child learns best. With support at home and teaching strategies at work in the classroom, there is no reason why kids with ADHD can’t flourish in school. Remember that your child’s teacher has a full plate: in addition to managing a group of children with distinct personalities and learning styles, he or she can also expect to have at least one student with ADHD. Teachers can do their best to help your child with attention deficit disorder learn effectively, but parental involvement can dramatically improve your child’s education. You have the power to optimize your child’s chances for success by supporting the work done in the classroom. If you can work with and support your child’s teacher, you can directly affect the experience of your child with ADHD in the classroom. There are a number of ways you can work with teachers to keep your child on track at school. Together you can help your child with ADHD learn to find his or her feet in the classroom and work effectively through the challenges of the school day. As a parent, you are your child’s advocate. For your child to succeed in the classroom, it is vital that you communicate his or her needs to the adults at school. It is equally important for you to listen to what the teachers and other school officials have to say. You can make communication with your child’s school constructive and productive. Try to keep in mind that your mutual purpose is finding out how to best help your child succeed in school. Whether you talk over the phone, email, or meet in person, make an effort to be calm, specific, and above all positive—a good attitude can go a long way in communication with school. Plan ahead. You can arrange to speak with school officials or teachers before the school year even begins. If the year has started, plan to speak with a teacher or counselor on at least a monthly basis. Make meetings happen. Agree on a time that works for both you and your child’s teacher and stick to it. Avoid cancelling. If it is convenient, meet in your child’s classroom so you can get a sense of your child’s physical learning environment. Create goals together. Discuss your hopes for your child’s school success. Together, write down specific and realistic goals and talk about how they can be reached. Listen carefully. Like you, your child’s teacher wants to see your child succeed at school. Listen to what he or she has to say—even if it is sometimes hard to hear. Avoid interrupting. Understanding your child’s challenges in school is the key to finding solutions that work. Share information. You know your child’s history, and your child’s teacher sees him or her every day: together you have a lot of information that can lead to better understanding of your child’s hardships. Share your observations freely, and encourage your child’s teachers to do the same. Ask the hard questions and give a complete picture. Communication can only work effectively if it is honest. Be sure to list any medications your child takes and explain any other treatments. Share with your child’s teacher what tactics work well—and which don’t—for your child at home. Ask if your child is having any problems in school, including on the playground. Find out if your child can get any special services to help with learning. Children with ADHD are capable of appropriate classroom behavior, but they need structure and clear expectations in order to keep their symptoms in check. As a parent, you can help by developing a behavior plan for your child—and sticking to it. Whatever type of behavior plan you put in place, create it in close collaboration with your child’s teacher and your child. Kids with attention deficit disorder respond best to specific goals and daily positive reinforcement—as well as worthwhile rewards. Yes, you may have to hang a carrot on a stick to get your child to behave better in class. Create a plan that incorporates small rewards for small victories and larger rewards for bigger accomplishments. ADHD impacts each child’s brain differently, so each case can look quite different in the classroom. Children with ADHD exhibit a range of symptoms: some seem to bounce off the walls, some daydream constantly, and others just can’t seem to follow the rules. As a parent, you can help your child with ADHD reduce any or all of these types of behaviors. It is important to understand how attention deficit disorder affects different children’s behavior so that you can choose the appropriate strategies for tackling the problem. There are a variety of fairly straightforward approaches you and your child’s teacher can take to best manage the symptoms of ADHD—and put your child on the road to school success. Students with ADHD may be so easily distracted by noises, passersby, or their own thoughts that they often miss vital classroom information. These children have trouble staying focused on tasks that require sustained mental effort. They may seem to be listening to you, but something gets in the way of their ability to retain the information. Helping kids who distract easily involves physical placement, increased movement, and breaking long work into shorter chunks. Seat the child with ADHD away from doors and windows. Put pets in another room or a corner while the student is working. Alternate seated activities with those that allow the child to move his or her body around the room. Whenever possible, incorporate physical movement into lessons. Write important information down where the child can easily read and reference it. Remind the student where the information can be found. Divide big assignments into smaller ones, and allow children frequent breaks. Kids with attention deficit disorder may struggle with controlling their impulses, so they often speak out of turn. In the classroom or home, they call out or comment while others are speaking. Their outbursts may come across as aggressive or even rude, creating social problems as well. The self-esteem of children with ADHD is often quite fragile, so pointing this issue out in class or in front of family members doesn’t help the problem—and may even make matters worse. Reducing the interruptions of children with ADHD should be done carefully so that the child’s self-esteem is maintained, especially in front of others. Develop a “secret language” with the child with ADHD. You can use discreet gestures or words you have previously agreed upon to let the child know they are interrupting. Praise the child for interruption-free conversations. Children with ADHD may act before thinking, creating difficult social situations in addition to problems in the classroom. Kids who have trouble with impulse control may come off as aggressive or unruly. This is perhaps the most disruptive symptom of ADHD, particularly at school. Methods for managing impulsivity include behavior plans, immediate discipline for infractions, and ways to give children with ADHD a sense of control over their day. Make sure a written behavior plan is near the student. You can even tape it to the wall or the child’s desk. Give consequences immediately following misbehavior. Be specific in your explanation, making sure the child knows how they misbehaved. Recognize good behavior out loud. Be specific in your praise, making sure the child knows what they did right. Write the schedule for the day on the board or on a piece of paper and cross off each item as it is completed. Children with impulse problems may gain a sense of control and feel calmer when they know what to expect. ADHD causes many students to be in constant physical motion. It may seem like a struggle for these children to stay in their seats. Kids with ADHD may jump, kick, twist, fidget and otherwise move in ways that make them difficult to teach. Strategies for combating hyperactivity consist of creative ways to allow the child with ADHD to move in appropriate ways at appropriate times. Releasing energy this way may make it easier for the child to keep his or her body calmer during work time. Ask children with ADHD to run an errand or do a task for you, even if it just means walking across the room to sharpen pencils or put dishes away. Encourage the child to play a sport—or at least run around before and after school. Provide a stress ball, small toy, or other object for the child to squeeze or play with discreetly at his or her seat. Limit screen time in favor of time for movement. Make sure a child with ADHD never misses recess or P.E. Difficulty following directions is a hallmark problem for many children with ADHD. These kids may look like they understand and might even write down directions, but then aren’t able to do what has been asked. Sometimes these students miss steps and turn in incomplete work, or misunderstand an assignment altogether and wind up doing something else entirely. Helping children with ADHD follow directions means taking measures to break down and reinforce the steps involved in your instructions, and redirecting when necessary. Try being extremely brief when giving directions, allowing the child to do one step and then come back to find out what they should do next. If the child gets off track, give a calm reminder, redirecting in a calm but firm voice. Whenever possible, write directions down in a bold marker or in colored chalk on a blackboard. One positive way to keep your child’s attention focused on learning is to make the process fun. Using physical motion in a lesson, connecting dry facts to interesting trivia, or inventing silly songs that make details easier to remember can help your child enjoy learning and even reduce the symptoms of ADHD. Children who have attention deficit disorder tend to be “concrete” thinkers. They often like to hold, touch, or take part in an experience in order to learn something new. By using games and objects to demonstrate mathematical concepts, you can show your child that math can be meaningful—and fun. Play games. Use memory cards, dice, or dominoes to make numbers fun. Or simply use your fingers and toes, tucking them in or wiggling them when you add or subtract. Draw pictures. Especially for word problems, illustrations can help kids better understand mathematical concepts. If the word problem says there are twelve cars, help your child draw them from steering wheel to trunk. Invent silly acronyms. In order to remember order of operations, for example, make up a song or phrase that uses the first letter of each operation in the correct order. There are many ways to make reading exciting, even if the skill itself tends to be a struggle for children with ADHD. Keep in mind that reading at its most basic level made up of stories and interesting information—things that all children enjoy. Read to children. Read with children. Make reading cozy, quality time with you. Act out the story. Let the child choose his or her character and assign you one, too. Use funny voices and costumes to bring it to life. It’s tough to enjoy learning when there is something undiagnosed standing in the way. In addition to ADHD, children may also be affected by learning disabilities. These issues make even the most exciting lessons extremely difficult for students. Like children with attention deficit disorder, children with learning disabilities can succeed in the classroom, and there are many ways you can help. Sure, kids may universally dread it—but for a parent of a child with ADHD, homework is a golden opportunity. Academic work done outside the classroom provides you as the parent with a chance to directly support your child. It’s a time you can help your child succeed at school where you both feel most comfortable: your own living room. With your support, kids with ADHD can use homework time not only for math problems or writing essays, but also for practicing the organizational and study skills they need to thrive in the classroom. With organization, it can help to get a fresh start. Even if it’s not the start of the academic year, go shopping with your child and pick out school supplies that include folders, a three-ring binder, and color-coded dividers. Help the child file his or her papers into this new system. Establish a homework folder for finished homework. Check and help the child organize his or her belongings on a daily basis, including his or her backpack, folders, and even pockets. If possible, keep an extra set of textbooks and other materials at home. Help the child learn to make and use checklists, crossing items off as they are accomplished. Help organize loose papers by color coding folders and showing the child how to hole-punch and file appropriately. Understanding concepts and getting organized are two steps in the right direction, but homework also has to get done in a single evening—and turned in on time. Help a child with ADHD to the finish line with strategies that provide consistent structure. Pick a specific time and place for homework that is as free as possible of clutter, pets, and television. Allow the child breaks as often as every ten to twenty minutes. Teach a better understanding of the passage of time: use an analog clock and timers to monitor homework efficiency. Set up a homework procedure at school: establish a place where the student can easily find his or her finished homework and pick an appropriate and consistent time to hand in work to the teacher. Authors: Jeanne Segal, Ph.D. and Melinda Smith, M.A. Last updated: November 2012. Purchase our book online or at a retailer near you! 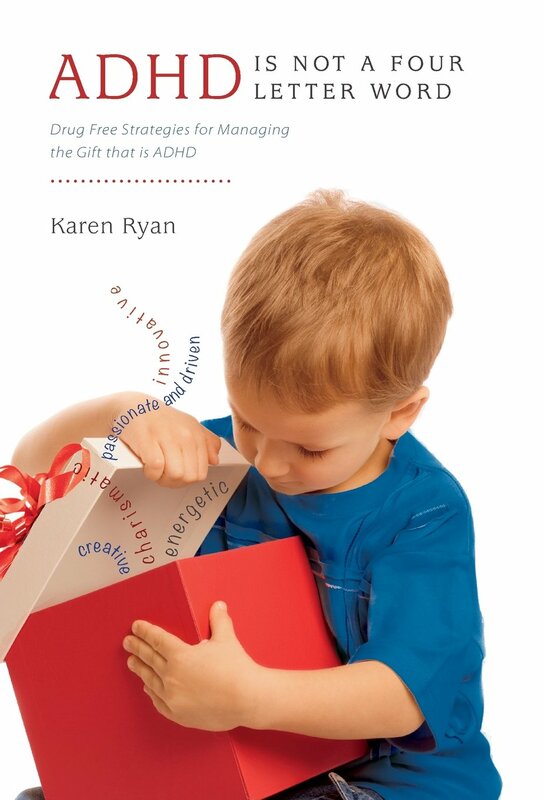 In this groundbreaking guide, respected nutrition expert Karen Ryan shatters the stigma of ADHD and offers an eye-opening new look at this long-misunderstood condition. Dispelling the myths that have come to define ADHD as an irreversible disorder, Karen shares the many facets that make up this gift while offering an abundance of drug-free strategies through which a child's true creativity and character can shine. Food Additives and ADHD: What’s the Connection?